There was a time when Dalton Casey ran the Casey family while grooming the next generation, but Cain Casey inherits the reins too early when Dalton is gunned down. 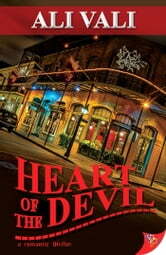 His loss leaves Cain devastated, and she does her best to keep the business together, but his loss has left her adrift and hungry for revenge. That ends the night a new employee douses her in beer. Emma Verde has left everything behind in Wisconsin to attend Tulane in New Orleans. She sees an opportunity to make enough money for the coming semester when she lands a job at an Irish pub in the French Quarter. That job soon spirals into something else. That’s the story we know, but this is the tale of how Cain and Emma fell in love, and their history proves that love was the only thing that saved the heart of the devil.